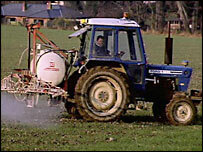 A series of mystery illnesses in a Kent village is being blamed on chemicals sprayed on fields. One woman from Lamberhurst says she has recorded 38 incidents of cancers and other illnesses in people living in and around the village. Tessa Lawton claims all of the disorders are linked to crop spraying. She says she has had ME (Myalgic Encephalomyelitis), stemming from severe chemical sensitivity - as have her husband and her 18-year-old son. Lamberhurst, close to the Kent-East Sussex border, is surrounded by agricultural land. Campaigners in Sussex also fear they have been affected by chemicals. With pesticides having been widely used in farming in the UK since the 1950s, Mrs Lawton has pointed the finger at the sprays as the cause of the illnesses in the village. She says virtually all of the people she knows to have had serious illnesses in the village have lived there for 25 years or more and many of them have worked on the land. She said: "It needs investigation and it needs all the people affected to come forward because I think there are so many people that suffer all sorts of mystery ailments that don't know why. "I think they need to come forward and say 'me too' and then we can start seeing how many people there are because I don't think anybody knows. "It's the same for cancers, because there seem to be an awful lot of breast cancers and stomach cancers, again related to people working in agriculture and the gardening industry. "I think it all needs to be put together in one gigantic computer file so we can see how many people are affected." 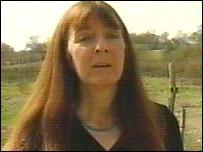 Campaigner Georgina Downs, of Chichester, West Sussex, also claims her family's health has been wrecked by sprays. The 29-year-old was admitted to hospital aged 18 with chronic muscle wastage brought on, she says, by years of exposure to pesticides sprayed on fields bordering her garden. Her father Ray's eyesight has been permanently affected after his eyeballs were burned when he was caught in chemical spray. Her mother Jeanne suffers intense fatigue and weakness. Investigations by Ms Downs have prompted ministers to promise the risks of pesticides will be re-examined later this year. The government says the sprays are safe, but that it wants to end the concerns of residents. Professor David Coggon, chairman of the government's Pesticides Advisory Committee, said: "We are trying to identify further worst case scenarios, just to be confident that there may not be some very rare circumstances in which degrees of safety might be too low."